This page is an accumulation of notes and concepts regarding Assimilation Art. Because its a work in progress it may take me years to put it together, but as I devise a working set of parameters I will add them here. Check back often for new information and I truly welcome your comments and participation in this emerging art form. Assimilation Art - Is the merging of two or more distinct art forms into one or more new forms. In some ways it is similar to mixed media art. Assimilation art may yield multiple end products where mixed media usually results in one piece of finished art. Assimilation art may produce multiple finished art pieces spawned from the same original work that are all different. 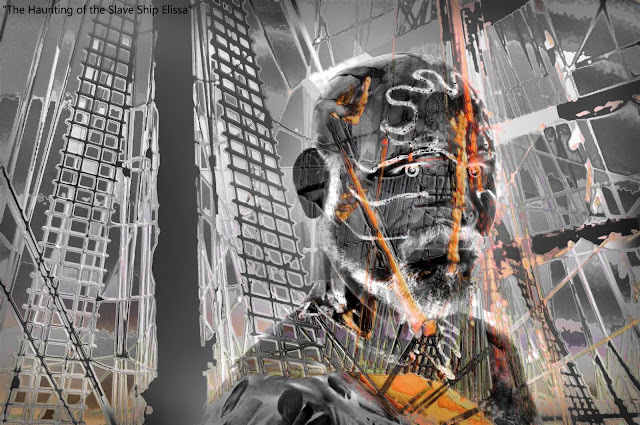 Assimilation art may also take one art form and morph it into something new. For example, the artist creates a photo series that morphs into a painting based on that photo series that again morphs into a sculpture, etc etc. The technical Greek definition of morphology means "the study of shape". At its very basic definition this is assimilation art. You are studying the shape and how it changes over time and how it can take on new shapes and forms. Assimilation Art is all about this morphing process. What starts out as one form of art constantly morphs into new forms. We do this constantly in art but its done at such a subliminal level that we do not even realize we are doing it. Take for example a painting that inspires the artist to write a poem about it also. Is the painting mixed media? No. Is the poem? No. But would the poem have come into existence without the painting? The painting morphed into the poem which might in turn inspire a song or a sculpture based on the painting. Or a sculpture based on the song. The song might in turn spawn the creation of a new and totally unrelated painting that in no way resembles the original painting. Every single piece in the process is related indirectly to the rest. Assimilation Art is about taking the process to a conscious level. Instead of just by chance having one piece of art morph into another, you are controlling the process and creating with the goal of morphing. Challenging yourself to find as many ways to morph an original piece of work is a great way to get started in the process of Assimilation Art. It does not even take having to create something new. The process can begin from an older work brought back to life and reinvigorated through the morphing process. I do this all the time. So lets look at how I create assimilation art. While this is one example it is not the only example. In this case I am beginning with body painting. 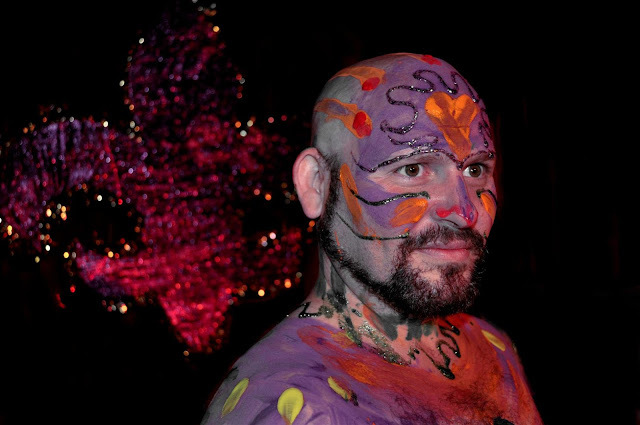 Most body painters do so with the intention of creating performance art with it. The body is painted in front of a live audience and exposed to that audience once completed. 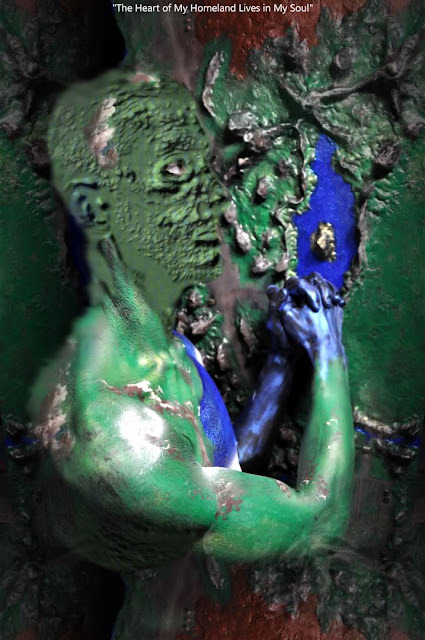 Here the body was painted first (art form #1), then photographed (art form #2), then digitally manipulated (art form #3) to create a unique final piece of art. 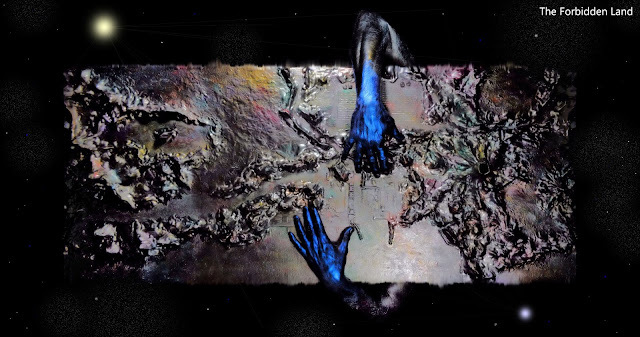 The final image could not be created without the merging of each distinct art form. Now that art form can be morphed into yet other pieces of art. In this case it will include printing the final piece of art and yet morphing it into a true painting by over-painting the photo with acrylics. The possibilities are endless with assimilation art. Truly the final painted piece could then be photographed with another body painted model and the process allowed to begin all over again. The point is with assimilation art to get as much mileage out of this merging and morphing as can possibly occur constantly reproducing variations that take on new forms. The Cycle - The cycle is the curve in which all related art forms are created. The cycle begins with the base line art and continues as far as you can stretch it. A cycle may last months, or years or may come to an abrupt halt and then continue on years later. Morph Points - Are the accumulated points where one morph occurs into the next. The Morph point is not a merge of a new element, but can be a morph from a previously used element. Spawn - The specific piece of art after morphing. The Spawn illustrates the variety that comes from the morphing concept. Bridging - Bridging is the process of merging one series of art into the next. It is the point where two distinctly different series connect by adding elements from both of those series into a single work of art. Old Into New - This is the concept of bringing in a piece of art that is older and merging it into something new. I've struggled in the past few weeks about the best ways to both present information about this subject and the best way to keep notes on it. With this in mind, I am leaving all information related to assimilation art on one page rather than scattered throughout various articles. The topmost portion of this page will be for basic explanations of the theory and definitions to be expanded upon. After that will be working notes for the subject such as this one is. The concept of Merging into the Morph has come about from the current project I am working on. This is a 37" piece of driftwood that will eventually be a sculpture. I've decided to merge it into the Dark Shadows series. Dark Shadows is directly related to trees. It includes both digital print art created from original photographs and sculptures made from driftwood. This piece of driftwood though will not be in the conceptual form of a tree which has been the form the other 5 sculptures have taken. This will stand alone as a single piece but the story behind it will merge into the Dark Shadows and become yet a third form with the series. So this piece is going to merge into the whole cycle, thus the term Merging into the Morph. But there is yet another part to this. I've already made the decision to do the next Revenant body painting posed with this new piece. This gets confusing as I am technically marrying the Revenant Cycle to the Dark Shadows cycle. Damn that even sounds confusing. What will result will be a body painted series that could technically be included into either series. So the morphing process continues and becomes more and more complex. Where does it stop? It doesn't. That's the key to assimilation art, it continues and it morphs over and over again always looking for ways to interconnect the individual pieces until they are snarled in the midst of an artistic spider web. Its something to think about for sure! This is a current chart of the morphing process for the Revenant Cycle. The most difficult part of this process is that you can get lost in morphing process. As can be seen in Morph #5, the process came back to the sculpture process that it began with but the morph is completely different than its origination point. The morphing points are endless and can create somewhat of a Gordian knot. Its actually a challenge to see how many times you can loop it back upon itself. 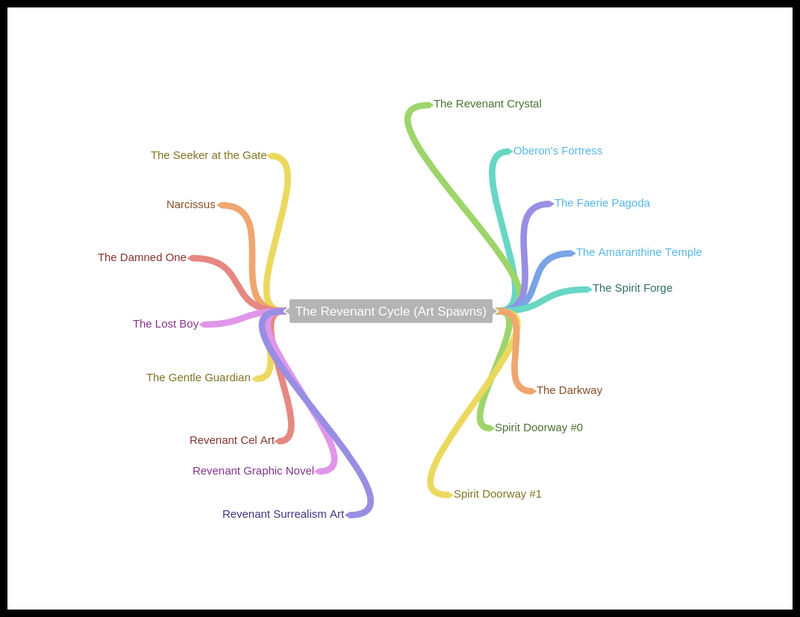 This graphic represents to date all works of art spawned from the original Revenant Cycle concept. Some are complete (those pieces have names), some are in development. But it helps to illustrate how the original concept can spawn over and over again. I am about to introduce a new concept into the Assimilation theory. The concept of bridging. This is where the artist literally bridges one art series into the next thus connecting them. For example. I am finishing the driftwood series of sculptures in the next month or so. This will effectively end a specific body of work even though I may do more driftwood pieces later. My plan is to begin a new series called the Urban Fairie Tale into being once the driftwood series is complete. But I may take one specific piece from one series and merge elements of both series into it, creating a bridge between those series. I will consider this more in coming days and talk more about it in future updates. The concept of Bridging between series has been occurring in my art before I even put a name to the concept. Pictured here is the Hurst Tomb. It was the last tomb sculpture made before I shifted to driftwood sculptures. It is a bridge because it incorporates elements of both series. It is still a tomb but I used two shards of driftwood to form the dead tree jutting out of the tomb. Bridging is an important aspect of Assimilation Art because it can assist in forming that essential element between what may be two very dissimilar bodies of work. It is also not limited to just one piece of art but may span several or even incorporate a bridge between more than two series. Old Into New. The whole concept of old into new is taking a piece of art from a far earlier era of the artists work and merging it into a newer concept. The example pictured below is a piece of art done 5 years ago. It was originally part of the hurricane series and had a clock in the center with the hands halted at the time of landfall for Hurricane Katrina. Unfortunately the clock face and glass cover was decimated in a small accident in the studio rendering it pretty much useless. Now it will be retasked into a new piece of art within the driftwood series. So its merging and assimilating into something new. It can be confusing because you are always merging something older with something newer, but in this case the item is totally unrelated and very old and has absolutely no ties to the current work. What I mean by this is that any given piece of art no matter how complete it may seem can be adapted into something new. If you stop thinking of your art as complete and begin thinking of it as merely a step towards something else then it opens a whole new field up of imagination. Take this piece for example. I will outline the steps towards the current. This began as a body painting done on a live stage 7 years ago. Here is the original completed piece. The photo was never meant to be the art. The live show was meant to be an art but I captured images of the piece as it was completed. There were four hours of planning and actual work involved in the original body painting. The next step took place 4 years later during the shooting of the Tall Ships in New Orleans. This piece was meant to be a free standing piece of art. There were about 5 hours of work to complete the photo to my satisfaction. The merge of these two images into a single piece of digital art took place about a year ago. There are approximately 15 hours of work to complete the image. Laid out like this you can easily see the merge of the two images into the new piece of art. This brings up to present day (as of the time of this writing) where the final image is being taken yet a step further. The image was blown up and printed. Now it is in the process of being layered in polyurethane and overpainted with metallics to bring out some of the details. The result when complete will be a truly unique and one of a kind piece of art. The result is that any one of these pieces of art could have been considered complete. But using the Assimilation Art technique and the rule of "Nothing is Ever Complete" we now have four piece of art. And who knows from this point on what may occur with it. I can think of at least ten different things I could do to continue the process on this one piece of art alone. Basically Outsider Assimilation works in two directions. Either you are assimilating another persons art into your own, or another person is assimilating a piece of your own art into theirs. This is a sticky gray area where it is always best to err on the side of caution. If you know the artist or how to contact them then get their permission whenever possible. In the case of public art, art installations, exhibits, etc. the rule of thumb is that if its publicly displayed then its expected that others will photograph it. This part of an open exhibition of art called the China Lights. Its part of a lit display that has been created and erected as a temporary display touring the United States. In all likelihood this piece of art was created by multiple artists under the guidance of one master artist who oversaw the creation of the touring display. It is expected that all the art in this tour will be photographed thousands of times over and shared all over the social networks of the internet. This is totally permissible. What is not permissible would be for me to put the photo out and claim the art as my own creation. But many people will use the photos for their own purposes and pretty much once a piece of art becomes public its difficult to control the flow of images. Now consider for a moment if I were to be sitting in front of this sketching it out in pencil and then took the sketch home and used water colors to fill it in. Now the sketch is a new piece of art. The basic principle of Assimilation has been met because the original art has now morphed into a new form. I doubt anyone would question an artists sketch of this magnificent structure. The 50% threshold has been met (at least in my opinion) because the art has now taken on a totally new form. 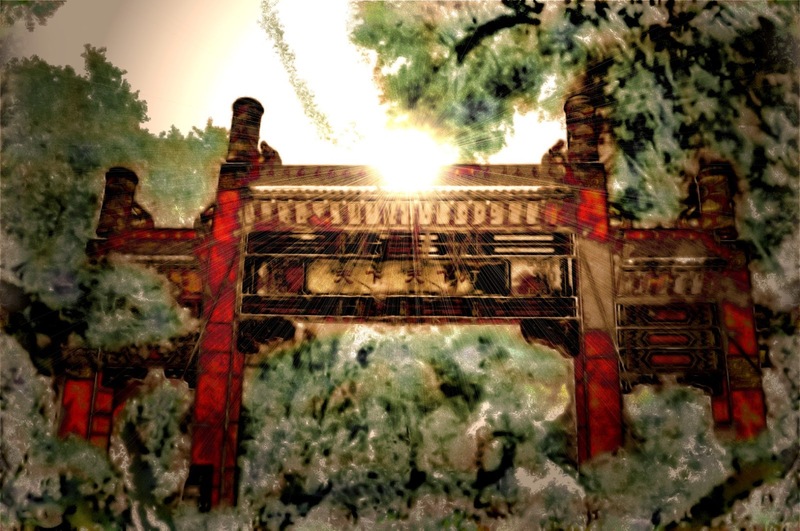 It uses different materials to recreate it, just as the arch itself was once perhaps a real arch in a Chinese temple or city. From here I could create a hundred different art forms from this one digital art piece and constantly morph it over and over again. Am I plagiarizing the original piece of art if I now claim it as my own art? Yes in a way I am. But what makes the difference is that threshold. Again if I claim it as my own in the original form I am most definitely plagiarizing. When you consider that almost anything we see and mimic is a form of plagiarism, you need to exercise sound judgement as to whether you are meeting that threshold. And remember that the door swings both ways. Others may wish to assimilate your work into something new. If your confronted with it, think it through carefully, question the artist who comes to you and make a determination where the threshold lies. It may save you a lot of headaches later. As mentioned above, the term Old into New can be applied to an older piece of art that is refreshed and made new. . Constant Conversion on the other hand is taking an older piece of art and constantly converting it into something new. So lets look at a specific piece of old art. Terras Averinia was a landmass project. It stood 6 foot tall and 2 foot wide on a 3 inch frame. The original intention of the piece was not as a piece of art for sale, but to be used as a prop for a body painting project I was working on. Here you can see the model painted to match the landmass. As the piece continued the model was photographed with the piece and then turned into digital art as seen below. The original reason for creating the piece was achieved, but it left me with a rather large piece of art that wasn't really something that I felt people would buy. A few options were available. I could save the piece in hopes that I might use it again, after all about 30 hours of work went into its creation. I could deconstruct it and use the frame for something else. Or I could apply the rules of Assimilation Art and morph it into something totally new. I actually went with option #1 and stored the piece for about 8 months. But I am getting ready to start a new body painting project a week from the time of the writing of this update and felt that it might be interesting to morph the piece and use it in the next body painting. The first step is to bring the piece of art back to its black base. So I am going to use black spray paint to overpaint the original colors. Once thats completed I'm going to choose a pallet of metallics to blend into it, changing the color scheme 100% from the original. Here is the changed version. Its basically creating a very new piece of art that will once again only be used only in the body painting shoot. It has now undergone its first "constant conversion". Now it is ready to be used a new piece of art. You can see here how effectively it was used along with the body painting model and also note how different this image is from the image above used in the previous shoot. Now at this stage you would consider it done. I've created two piece of art out of it and used it both times. It could end here and still be considered "constant conversion". But I am going to take it to a third stage. I am now going to convert the piece one more time. For awhile I've wanted an impressive looking sign for the front of the studio. So now I am going to take the piece and begin yet another conversion. You can see that I've already added the studio name to it. I will also add my website address along the left hand side and perhaps a few other touches. Once completed it will be polyurethaned to make it as strong as possible to weather the elements and then placed in front of my studio. So we've now used "constant conversion" to create three distinct piece of art. This does not mean the process is done. As the weather will inevitably wear away at the piece, it may be used yet again for something else. Its difficult to say what the future might bring for it, but it is by no means considered finished. You can see how "constant conversion" differs from "old into new". If I had applied "old into new" I might have taken the piece and merged it with some other piece of art, or torn it down completely and reused elements of it, such as the frame or parts of the canvas. Its a fine line between the two rules and sometimes they cross over, but its important to remember that they can both be considered separate principles of Assimilation Art. Naming work that is spawned by the Assimilation Process is complex and confusing. Consider that its hard enough to name a piece of work once. But if that work spawns multiple variations of the original in different forms, how should they be named? Using the same name can lead to complications trying to sort through various adaptations using the same name. Yet naming each variation under a different name can be time consuming and lead to other confusions. As an artist we usually have a pretty clear vision for any given piece, but if you have five pieces all based on an original that take other forms, that vision can become blurred. One way to handle it would be to leave the original name but to create a lettered designation after the name. So the original title has no designation. "The Rock" Every version after the first carries "AA" after the title. Thus The Rock AA#1, The Rock AA#2, etc. But to further complicate matters, what if a new piece spawned from an original begs for a completely new title? Effectively that means that a piece may contain more than one name, such as "The Rock - The Gravel" That does not seem to make sense to me. What if a spawned piece spawns yet other art. "The Rock - The Gravel - The Glass". So you can see how the issue of Titles can become amazingly complex. You might say, "who cares, name it what you want".But I have to take the long view on this one. I have to consider that this can become amazingly confusing to collectors of that work in later years. If you are never sure where a piece of art came in a series, that can lead to devaluation of the art. There is also the thought that if Assimilation Art as a movement became popular that you could have a whole group of artists whose work becomes so muddled that it turns off the buyer later. If your collection all of the pieces in a series then clear understanding of the pieces in that series are important. So with all these thoughts in mind I feel its better to create a system of notations to make the issue easier to manage. Unfortunately at the moment I am at a loss how to manage it. If anyone has any suggestions they are definitely welcome and I will consider the matter further and add to this later. The concept of Ephemerality fits nicely with both the assimilation art concept and for use as a marketing tool. The idea is a little hard to wrap your mind around I admit. It was originally developed around the idea of deconstruction of art. This was was unrelated to Assimilation art. It dealt with artists occasionally taking back a part a piece of their art. THis could not be done with paintings of course, but for any of us who deal with art forms that are constructs it was sometimes worthwhile to deconstruct our art and learn about different aspect of the art through that deconstruction. Ephemerality by its very nature is defined as the concept of things being transitory and existing only briefly. In the art world, performance art would be an example of ephemerality. It only exists while its being performed. But my mind got to considering ephemerality in solid art. When I coupled the idea with deconstruction, I began to envision a new avenue of Assimilation art where a piece of art exists only for a short period time before it is deconstructed and reconstructed as something new. The idea fits in smoothly with the assimilation concept because it is about using ones art over and over again. Now you might ask, "why would you want to deconstruct a piece of art once you've completed it?" I can see several areas. The first being the original idea of deconstruction, that it teaches us something about the strength of our art. What materials do we use that are sturdy enough to survive a careful deconstruction. But besides that, ask yourself, how many times have you looked at a piece of your art and thought "I could have done better" and wanted to tear it apart and start from scratch? Is it beyond reason that even if you like a piece of art that you may see other shapes and other ideas in that piece of art that you might wish to explore? I do this constantly. I see a piece of my work where I think, "wow, if I see something totally different in it now. If I moved that, and turned that over and used that color, it would turn into something totally different. For us who practice Assimilation as a total conceptual process, we do this constantly even if we resist the urge to change something. But perhaps we shouldn't resist the urge. Occasionally greater things can come from it. For example, I had a large piece I'd done several years ago. It was a temple complex standing 5 feet on each side and rising 4 feet into the air. It was huge, unwieldy and took up a great amount of precious storage space. But in its construction I learned a huge amount about constructing art and some new processes in using Styrofoam as an art agent. I also learned more in that one piece regarding the making of buildings than I'd ever learned in any other art. But once I'd finished it, I'd learned what I needed to learn and it was unlikely it would ever sell. For one thing, where would they put it? It was not a wall piece. It would have to be displayed flat. Second, it was so big that I was constantly bumping into it and destroying small portions. So it gathered dust for several years until I decided one day I had to deal with it and would deconstruct it. I didn't just dump it in the garbage nor did I rip it apart into chunks. Instead I carefully dissected it, saving individual portions of it. Those portions were then brought into the studio and reconstructed as smaller sculptures or portions used in other sculptures to add to them. This is ephemerality. The original piece morphed into totally new work, still keeping some aspects of its original form. Now consider ephemerality as a marketing tool. What would be the reaction if you told a potential buyer that a beautiful piece of art they'd been eyeing would be destroyed in say 30 days? Well besides the person thinking you were nuts, if they loved it enough all indecision would vanish and they might jump to buy it before its gone. Now take that to a wider scale. What if you began advertising in this way? What if you gave some of your art a shelf life and counted down the days to its imminent demise? Would this improve its chances of being sold? I don't know the answer to that yet, but I plan to find out. Consider also that Assimilation, like any good art movement, is not about selling the work but about exploring the concept. Ephemerality is by its nature so off the beaten path that it begs to be explored further. The concept for Step by Step Evolution (SSE) came from an article called Vanishing Art. While the article had nothing to do with this concept, the title of the article got my mind working on a new idea which eventually ended up as SSE. The best way to describe the concept is to think about photographers who take photos of themselves or others over and over again in the same pose every year, building up a view of that person as they age. This is similar to the Old into New concept (above) but rather than just change one piece of art into a new one, the art is in part in the step by step of the morphing process. Its turning the process into the art, not just the final outcome of the art. When you consider it, its not anything different than many artists do when painting over a piece of art that they previously created because they didn't like it. But instead of just painting over it and starting from scratch the morph takes place in stages and its the morph itself which is the art. Over the past few weeks I've been revisiting some of my earlier blog articles (such as this one) and found myself updating them, changing parts, adding information where there were gaps in my previous knowledge. In some cases completely reworking the article and evolving the subject matter. Unlike this specific article that you are reading which is updated periodically, I am talking about a complete reworking of the original. I realized that I am doing the same exact thing that I would do with a piece of my art. I am using the concepts of Assimilation in another form of creativity. Rather than say "the article is finished", instead it is an ever evolving piece where new skills, new information reform the original idea. I knew that Assimilation Art could function on multiple levels of creativity, but I hadn't really seen a good example of it until now. I would like to see examples from others who specialize in a particular area of creativity and see how they function. Music I would think would be the most difficult area to apply Assimilation to, but it is possible.